Specially designed for Nn1 discriminating railroads, when nothing else will fit. On theone hand they do look odd, on the other hand, they are perfect for coal docks and the like. These little machines are Field Pushers and Pig Pushers. Operated by longshoremen, they move on a narrow gauge track adjacent to the rail yard tracks. These machines are used to move loaded coal cars , two at a time, from the "buck yard" to the barney pit where the cars are then pushed up an incline to the rotary car dumper." There are some pictures of pusher locomotives at the Northeast Railfan website too. These in this second link look more unusual than those big ones in the link above. Was that Pennsy one battery? I wish I could answer you on that but I haven't been able to find out any more about it. I just think it has a sweet rugged look that the other pusher locomotives I've seen dont have. now for today's dumb question - assuming these units had arms that pushed on the end of the car to get it rolling, how did you stop the car when you had moved it enough? It looks like the arms do not mate up with the car's couplings and there does not appear to be air pipes/hoses for the airbrake systems. Did you rely on a shunter on the ground winding on the handbrake or something else? If these were used around piers and wharfs, one wrong move stopping a car in time and its "SPLASH" at the end of the pier. TRUE story - the Habourmaster (aka port boss or Chief Harbour Pilot) was down at the one of the wharves at a local port. While he was there he saw a shunting "accident" where one of the wagons went off the end of the wharf after being given too much of a "nudge" by the loco. So the Harbourmaster organised for a diver to go down and hook cables onto the wagon so that the offending wagon could be lifted back onto the wharf by the wharf crane so that the drowned wagon wouldn't interfere with port operations near the end of the wharf. After a period underwater the diver surfaced, without hooking up the wagon. After they got his helmet off the harbourmaster asked the diver if he found the wagon and why hadn't he hooked up the cables. In typical laid back Aussie style, the diver said 'Yeah, but you didn't tell me which B****y wagon you wanted - there's another 6 of 'em down there". The names of the port and the wharf have been omitted to protect the guilty. 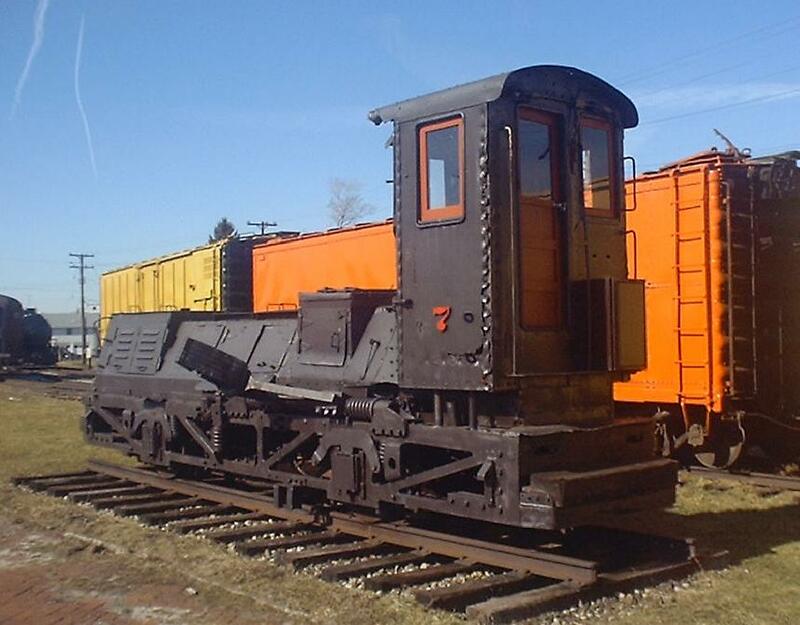 Here is another angle of the PRR #7 pusher. I wish I knew a little more about how they were used. Here's a video of a Hulett unloader working. At around 1:17 you'll see one of these "mules" (?) move. I'm wondering if there isn't some kind of power supplied between it's tracks. Looked a little closer at the pictures of the above links and blew them up some for a better look at those pusher arms. Only thing I can say is that they would probably push on the cars end beams about where the poling pockets use to be. Perhaps that's the reason the moved two cars. The arm was placed down between the two cars end beam. The pictures got a little grainy blowing them up. It gives a good idea of what they looked like. I think I may be right on the possibility that the electric ones used a center pick. I found a nice shot from up high onto the tracks under a Hulett unloader.